What’s a good Catholic girl to do? Nora’s brother is leading a group of vampires who want reinstatement as cops, and Nora herself has been bitten by the same vampire who killed all those cops. So she turns, naturally, to the Church. Hasn’t she seen any vampire flicks with crosses and stakes? Find out what happens when Nora O’Donnell tries to explain vampires to good Father Quinn, in chapter 32 of Martha’s Children, my serial of cops, vampires, and sorcerers in 1969 Chicago. If you’re not reading already, you can start here. A change of pace today. The L. Palmer Chronicles recently mentioned this blog in a new post entitled, “What Keeps Me Reading (Blogs),” citing Sillyverse for its intellectual/educational content. Well, I tell you! It’s not why I started writing the blog, but I’m happy to provide knowledge and other food for thought. To any reader who has followed her link, check out the posts in my “History” category as the best way to find examples. However, L. Palmer is more into nerd/geek culture, so today’s post is for her. 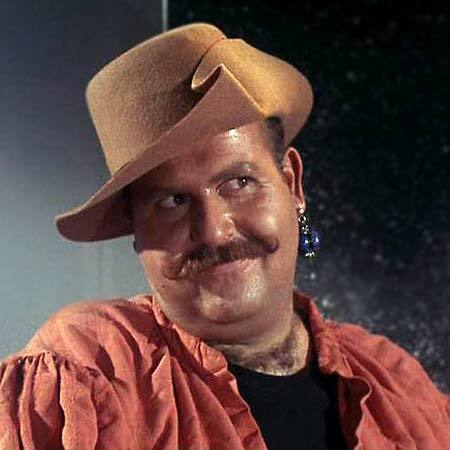 It is the birthday today of Roger C. Carmel (1932 – 1986), the only actor to twice play the same guest character in the original Star Trek, and then reprise the role for an episode of the animated Star Trek series. Carmel played Harcourt Fenton Mudd, commonly called Harry, a roguish trader whose antics always seemed to backfire while almost bringing the starship Enterprise to the brink of destruction. In “Mudd’s Women” (1966), he used crystals to make plain women look beautiful, while almost causing a failure in the Enterprise‘s engines. In “I, Mudd” (1967), he ruled over a planet of androids who took over the Enterprise. And the animated “Mudd’s Passion” (1973) crosses “Mudd’s Women” with the original series’s “The Naked Time,” to have Spock fall in love with Nurse Chapel, thanks to Harry’s crystals. Personally, I’d never seen the animated episode until last night when preparing this blog post. It was amusing, and was greatly in the same spirit as the two original episodes. On the other hand, in these post-feminist days, the attitude toward women in all three episodes (especially Nurse Chapel’s role in the animated episode) will grate on many people’s sensibilities. Carmel’s acting career was hardly confined to Star Trek. He also performed in The Alfred Hitchcock Hour, The Munsters, The Man from U.N.C.L.E., Voyage to the Bottom of the Sea, and Batman, along with many other television series and some movies in a career that lasted three decades. So a toast to the late Roger C. Carmel on his birthday. Someday I want to write a lovable rogue like his Harry Mudd. This entry was posted in Martha's Children, Writing fiction and tagged Chicago, fantasy, Harry Mudd, roger c carmel, Science fiction, Star Trek, vampire, Writing. Bookmark the permalink. I wouldn’t say “post-feminist” — although I forget whether we’re on the third or fourth wave now. It’s kind of depressing that these things aren’t a done deal, but eternal vigilance is the price of liberty. I suppose another way to make the same point is to say the range of acceptable depictions of women as sexually subordinate to men have shifted from what they were in 1966-73. Harry Mudd is a fun character. I have been entertained by people stating that the original series of Star Trek treats women better than Star Trek: Into Darkness. Most women in the original series arrived in the episode in tight-fitting outfits, and proceeded to make out with Kirk by the end of the second Act. There are a few exceptions, such as the woman who made out with Bones by the end of the second act. Both Chapel and Uhura were strong characters in the original series, but still relegated to a background character. Haven’t seen “Into Darkness” myself. I’d describe the original series as depicting the sexes as formally equal, but subject to 1960s restrictions: the costumes you mention, the willingness to fall in love with the leading man without any discernible reason, and never, ever, saving a man. Probably why there could be no female captains. And why the one woman who proclaimed her desire to be a captain was depicted as mentally unbalanced.